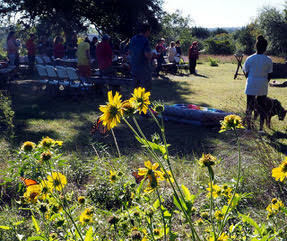 At New Life Lutheran Church, in Dripping Springs, Texas, we worship on a hill topped with century-old oak trees, with picnic tables, folding chairs, and an old horse trough for an altar. We see juniper trees, the wild grape vines from which we make our communion wine, and native bunch grasses that help recharge the aquifers below us. Deer and roadrunners often walk by during our worship services, and birds almost always join in our songs. Sometimes the wind is gentle, and sometimes challenging enough to remind us that the Holy Spirit, like wild spaces, is not tame. Worshiping outdoors is an experience of joy and an exercise of humility - we are not in control here. Every week, though, we fall in love with the Texas Hill Country all over again, and stand in awe of God’s creation. We are in the Colorado River watershed, above the Hays-Trinity and Edwards aquifers. We worship on the ancestral land of the Tonkawa people. On the 12-acres on which we worship, we have a prayer labyrinth, stations-of-the-cross walking trails, a bird blind which collects rainwater, a tent to be under in the rain, and no buildings. We plant vegetables in our community garden for our neighbors, and we plant trees and wildflowers to re-wild this former ranchland and re-introduce more biodiversity. 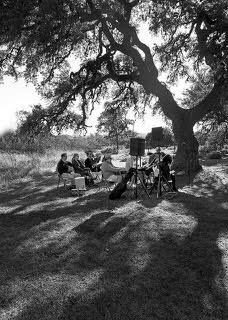 We worship outside because we feel close to God in the natural world, and we want to share this beautiful and sacred place with others.